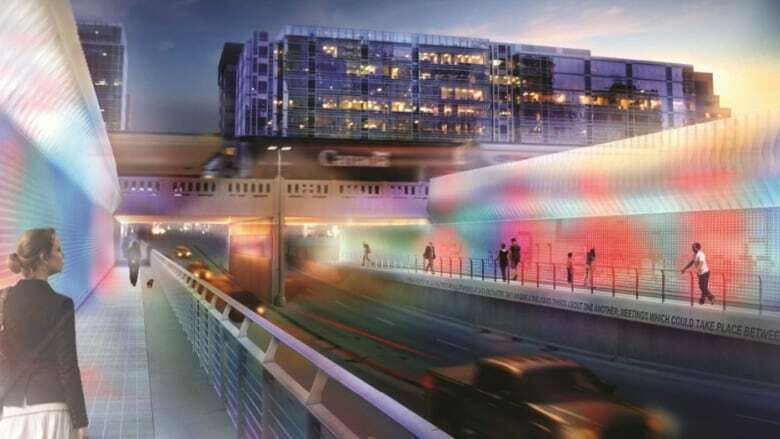 Calgary's $6.7-million plan to transform the dreary and sometimes scary underpass at Fourth Street S.W. involves an interactive light display that changes when pedestrians walk by it. Calgary's $6.7-million plan to transform the dreary and sometimes scary underpass at Fourth Street S.W. involves an interactive light display that changes when pedestrians walk by. That was the "highest rated" of the several ideas considered for the redesign of the major corridor, which connects the city's downtown core with the Beltline beneath the CP Rail tracks, according to a city report. City councillors will be asked on Friday to approve $2.2 million in additional funding for the project, which has $4.5 million already devoted to it. Half the additional funding would come from the developer-financed Beltline Community Investment Fund and half from the city's public art fund. Directors of both funds have voted in favour of using $1.1 million each toward the project. The city approved a series of downtown underpass renovations in May 2007 as part of a long-term plan for the area. Coun. Evan Woolley said the renovations are an important improvement to the "super-critical" links between the Beltline communities and the downtown core. "These underpasses are falling into unbelievable disrepair and are rather gross, terrifying places to pass through – at any time of the day," he said. More than than 42,000 pedestrians use the underpasses each weekday, according to the city, but many report feeling uncomfortable or unsafe in them, particularly at night. The report going before a city committee on Friday highlights the "deteriorating condition" of the Fourth Street S.W. underpass, in particular, and "perceived safety concerns" surrounding it. After considering several design concepts and seeking public feedback, the city opted to go with a proposal from Marc Boutin Architectural Collaborative and artist Krzysztof Wodiezko. "The introduction of animated light and colour, responding to the flow of people through the space, ensures the redesign remains evocative, varied and timeless," reads a description of the concept from the architecture firm. The plan is for construction to start later this summer.